Reconstruct your home interior by adding this superb table and side chair set to your casual dining or bar area. The table features an ornate hourglass like base that holds up a sleek glass top. 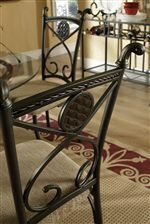 The chairs in this set have been finished in a striking dark finish and feature decorative backs with circular accents. Invite your friends over and take in a casual dinner with this stunning five piece dining set. The Brookfield 5 Piece Dining Set with Glass Top Table by Steve Silver at Walker's Furniture in the Spokane, Kennewick, Tri-Cities, Wenatchee, Coeur D’Alene, Yakima, Walla Walla, Umatilla, Moses Lake area. Product availability may vary. Contact us for the most current availability on this product.